Expo East, the conservative counterpart to the West Coast natural products show held annually in March in Anaheim, is taking place right now in Baltimore. I had the opportunity to walk the show floor on Thursday and can confidently report that dairy is thriving—and growing--within the natural products sector. Rightfully so, as dairy foods are a “natural fit” for the label-reading, health-and-wellness consumer who wants simple foods from Mother Nature. Milking a cow is much more real than milking a soybean, an almond or even a coconut. Interestingly, unlike in years past where non-dairy alternatives were more prominent than the dairy foods they were intended to replace, this year there was definitely more real milk, more real yogurt, more real cheese and more real ice cream. Here are seven themes observed at Expo East, all of which work for dairy. 1. Not Too Sweet. From beverages to snack bars, “not too sweet” has become very common packaging lingo. The emphasis is not on added sweeteners or even the use of no- or low-calorie sweeteners, rather it is directed to taste. Many manufacturers, dairy processors included, are talking about their use of higher quality fruits, flavors, enzymes and even cultures (in fermented products) to assist with the reduction of the sweet taste, which at the same time allows other real flavors to get tasted and appreciated by the consumer. One bar manufacturer explained that high-quality dark chocolate, which is loaded with antioxidants, is not as bitter as lower-quality chocolate, and this enables the use of less sweetener to mask the bitter. 2. Protein. It is no surprise that grams of protein per serving of all types of foods and beverages are being prominently called out on package fronts. Many products are combining dairy protein with plant protein to achieve concentrated levels. With one gram of protein in every ounce of milk, flagging protein content on dairy foods makes real sense. According to the Natural Marketing Institute, the general population of consumers has more protein awareness than ever before, as the percentage of those seeking foods high in protein grew from 39% in 2006 to 53% in 2014. This is driven by two factors, a wider availability of products boasting high-protein claims along with consumers’ heightened awareness of protein’s benefits, such as increased energy, optimized weight management and increased muscle mass and strength. 3. Whole Milk. Fat is no longer the enemy. Even dairy alternative manufacturers are boosting up fat levels with vegan fat sources. 4. Clear Packaging. Transparency is two-fold. Marketers are not only communicating the sourcing of ingredients, they are showing them off as well. 5. Ingredient Sourcing. Being the natural products show, terms such as organic, non-GMO, Fair-Trade and more are typical. What has become increasingly common is flagging the country of origin of certain ingredients, most notably fruits and vanilla. And within the animal protein segments—from chicken nuggets to ribeye steak and milk to yogurt—100% Grass Fed is becoming increasingly popular. 6. Coconut. Real coconut shavings/shreds, and coconut cream, are making their way into chips, snack mixes, protein shakes and cultured dairy. I’ve been told it is one of the most popular flavors with Millennials, the demographic who grew up drinking coconut water instead of isotonic drinks for hydration. 7. Cultured Dairy Beyond Yogurt. Kefir, skyr, cottage cheese and quark…there were numerous new product introductions in each of these cultured dairy foods categories at Expo East. Savory, spicy and coffee—cold-brew coffee, to be exact--flavors also continue to make inroads in these categories. This complements the “not too sweet” theme. Here are seven products showcased at Expo East. Watch your inbox this coming week for the Daily Dose of Dairy, which will feature some real show stoppers. B’More Organic continues to revolutionize the functional beverage industry by packing in a powerful punch of real, clean, sustainable dairy protein in its Organic Skyr Smoothie line. With no added sugar and up to 40 grams of protein per bottle, this gluten-free, low-lactose, probiotic cultured dairy beverage is made with milk from grass-fed cows. At Expo East, the company debuted B’More Coconut, which joins Banana, Caffe Latte, Mango Banana, Plain, Strawberry and Vanilla. B’More Coconut includes coconut cream, making it the first smoothie in the product line with healthful plant-based fat to support endurance, boost energy and tantalize taste buds with the creamy, delectable real coconut flavor. Every 15-ounce bottle of B’More Coconut contains 16 grams of healthy, plant-based fats. To date, there are more than 1,500 studies proving coconut oil and coconut to be one of the healthiest foods on the planet. Coconut cream differs from coconut milk as it contains less water and more coconut. An excellent source of minerals, namely manganese, iron, magnesium, copper, phosphorus, potassium and zinc coconut cream also contains B-vitamins including folate, thiamin, vitamin B6, niacin and pantothenic acid. Coconut cream is a great source of medium chain triglycerides, which turn to fuel in the liver and forgo stomach storage. Coconut cream has a unique combination of fats that has been found to be highly nutritious, according to Buerger. Congrats to B’More Organic for its continued expansion into the Southeast and the Pacific Northwest regions with Publix Super Markets and Market of Choice. B’More partnered with distribution companies UNFI and KeHE to ensure fast and efficient delivery of its product into these regions. 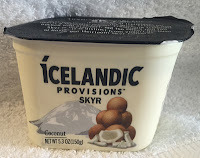 Icelandic Provisions, which produces cup-based skyr made using an original heirloom skyr culture (Streptococcus thermophilus Islandicus) from Iceland, is adding two new flavors: Coconut and Strawberry. Made with milk from grass-fed cows, the new flavors join Blueberry & Bilberry, Peach & Cloudberry, Plain, Strawberry & Lingonberry, and Vanilla. 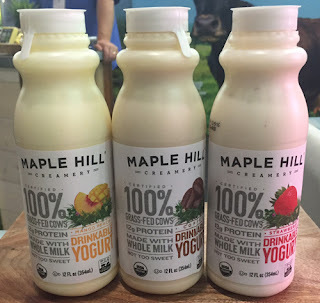 Maple Hill Creamery is growing its product lines with new flavors and formats. 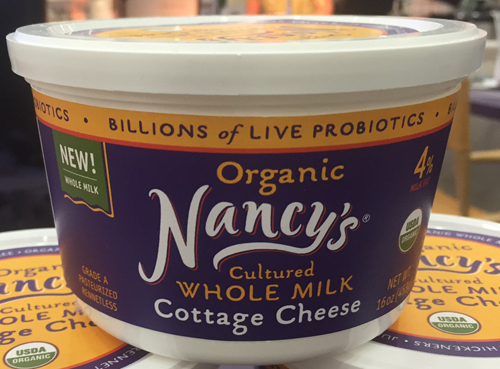 Oregon’s Springfield Creamery grows its Nancy’s cottage cheese line with a whole milk variant. Unlike many other cottage cheeses in the market, Nancy’s delivers billions of live probiotic cultures and is made without rennet or thickeners. Ingredient legends are very simple: Organic skim milk, organic cream, organic nonfat dry milk, L. acidophilus, B. bifidum, four strains of lactic cultures, salt. Orgain Inc., offers protein beverages to meet all protein preferences. Its Kids Protein Organic Nutritional Shake is made with a proprietary organic protein blend of grass-fed milk protein concentrate and whey protein concentrate. There are a number of plant-based protein beverages for adults. At Expo East, the company debuted Organic Cold Brew Coffee + Protein. Available in Iced Coffee and Iced Mocha varieties, the beverages contain protein from grass-fed milk protein concentrate, cream and rice bran extract. Each 11.5-ounce bottle contains 5 grams of fat and 10 grams of protein. There’s also only one gram of sugar, which comes from the cream. The product is sweetened by erythritol and stevia. The Liberte team at General Mills partnered up with the company’s Annie’s team at Expo East. 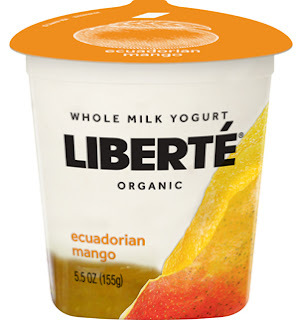 The company sampled its new Liberte Whole Milk Yogurt line. The Sweet Cream (unflavored) variety starts with pure, organic whole milk sourced from a co-operative of family farms. It’s then lightly sweetened with organic cane sugar. A 5.5-ounce cup contains 190 calories, 13 grams of fat and 5 grams of protein. The other seven flavorful offerings, made using the same local organic milk, come in an array of worldly flavors. They are: Californian Pomegranate, Baja Strawberry, Ecuadorian Mango, French Lavender, Lemon, Philippine Coconut and Washington Black Cherry. Each single-serve container, which is in clear plastic to showcase the layered ingredients, contains 210 to 220 calories, 11 to 13 grams of fat and 4 to 5 grams of protein. In January, the brand will be adding Indonesian Vanilla Bean to the line. There will also be two limited-edition flavors making their debut soon. They are: Chai and Nicaraguan Coffee Bean. Congratulations to Kourellas Dairy for being a Best of East finalist. 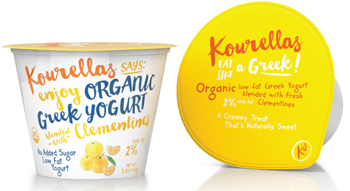 This company ships Greek fruit, authentic cultures and even packaging to New York to make its new Organic Greek yogurt line. Using the company’s traditional strained Greek yogurt recipe with origins in Grevena, Greece, Kourellas Dairy is entering the U.S. market with a small-batch, handcrafted Greek yogurt line that is made by real Greek dairy processors. That’s right, every batch of this artisan yogurt is produced with a minimum of two Greek-passport-owner dairy processors. This allows the company to make the label claim: Made by Greeks. Made with New York State milk, with everything else having Greek origins, the new line comes in six varieties. They are: Apple, Blueberry, Clementine, Kiwi, Orange and Strawberry. The yogurts contain no added sweetener of any type. They are naturally sweetened by the premium fruit puree imported from Greece. The low-fat organic blended yogurts have a simple ingredient statement: milk, cultures and fruit. Although Clover Stornetta Farms, a third-generation family owned and operated California dairy, did not exhibit at Expo East, it’s appropriate to recognize this dairy’s recent announcement to convert its conventional milk products to be Non-GMO Project Verified over the next two years. 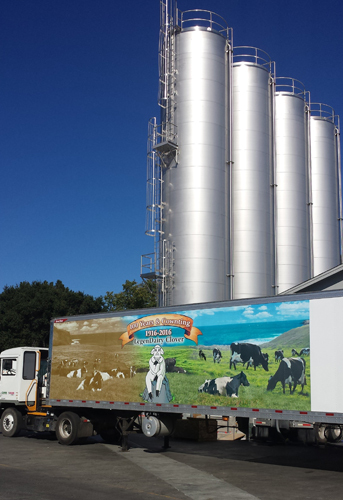 Clover will be one of the first Non-GMO Project Verified conventional milk products produced in California on a large scale. The first Non-GMO conventional milk products will hit shelves in the first quarter of 2017 and these will likely be on sampled at Expo West.